The Ethan Allen District consists of towns in Addison, Rutland, and Bennington Counties. 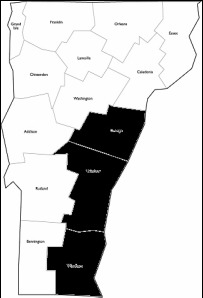 The Calvin Coolidge District consists of towns in Orange, Windsor, and Windham Counties. The Long Trail District consists of towns in Essex, Orleans, and Caledonia Counties, as well as parts of Lamoille and Washington Counties. The Three Rivers District consists of towns in Grand Isle, Chittenden, Franklin, as well as parts of Lamoille and Washington Counties.